Once the decision was made to move forward with the outdoor classroom, a Nature Explore workshop was scheduled at Green Sprouts for the staff and area educators. A staff meeting was held and each member was given an area to design. The principles and standards were reviewed and supply lists were created. A lot of thought was put into the design of the overall yard and each individual area making sure that each area was separated from one another and each area was a clearly defined activity area. A stepping stone path of pizza box pavers leads through the Entryway and into the outdoor classroom. The pavers were made by children and their families at a family event. Each family created their own paver. The gate and a portion of the fence was covered by bamboo, giving the entry a more natural look. An arbor was constructed out of birch trees to create a visual clue that one is entering a “special place”. Two bird feeders and a butterfly feeder were hung from the sides of the arbor and flowers and sunflowers were planted alongside. Signs for each area were made of bamboo sticks and small wooden name plates. Tree stumps of various heights were installed for the Climbing Area with bark mulch and rocks separating the areas from the walkway and nearby garden. 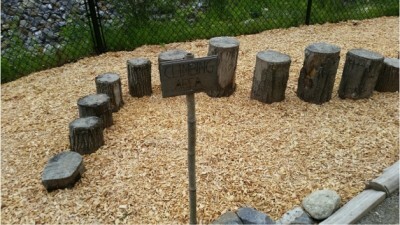 The children use the stumps in a variety of ways, and are very creative with their use. The Messy Materials Area is filled with sticks and branches, hay, mud, and bark. For the Building Area, a nice smooth surface of brick was used for the flooring which is durable and requires little maintenance. A small wooden table and a low maintenance slate easel implements the use of natural materials in the Art Area. A hose, a variety of buckets, containers and an outdoor funnel stand complete the Water Area. 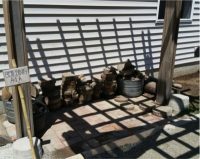 As many natural items and plants as possible were brought into the yard to create the outdoor classroom, but care was taken not make it appear too cluttered or overwhelming. International Mud Day will be celebrated this year with outdoor mud activities, reading mud books and eating “dirt” for snacks. Green Sprouts uses many activities from the World Forum Foundation’s Tool Kit for Families to help connect families to nature throughout the year.